Let’s suppose I’m wondering whether it is correct to write “to have a question for someone” or “to have a question to someone”. I can easily answer this question with Google by doing a search on “have a question to” and “have a question for” (note the quotes). When I search for “have a question to”, Google displays sentences taken out of the pages which contained the phrase. In the first few results, I see phrases like “have a question to ask Richard”, which is not what I was interested in. So I change the original query to “have a question to you” and find 416 pages. I notice that the first few results are from ESL websites, so they are not reliable. The search for “have a question for you” returns 28,600 pages. I conclude that “have a question for someone” is the correct phrase. Ask Antimoon user Johnny has recently shocked me by pointing out that the number of results given by Google is horribly inaccurate. 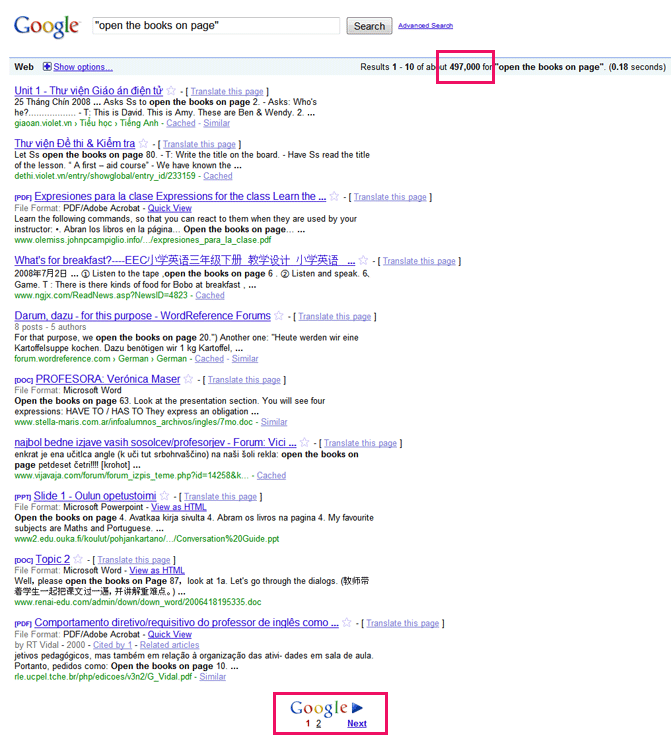 For example, when you search for “open the books on page”, Google tells you there are 497,000 results. But when you take a closer look, you see that there are only 11 results (10 on the first page, 1 on the second page)! I was always aware that the figure is an estimate, but I had no idea it could be off by 4 orders of magnitude! It appears that the numbers given by Bing are much more accurate, so if you’ve been using Google to answer grammar questions, you would do well to switch to Bing. Added 26 Dec 2010: Bing appears to suffer from the same problem now. you r doing great jo to help the people who are not a native speakers. your suggestions are so easy adopt it and for learning.